He made his first impact at international level in the South African Sevens team, playing a major role in teams that finished second in the 2001-02 IRB World Sevens Series and third in the 2002 Commonwealth Games. The talented back underlined his international credentials as part of the Junior Springboks side that won the IRB U21 World Championships in 2002. His performances, that included four tries, saw him rewarded with his first senior cap against France in November the same year. However his Springboks bow, at outside centre, was short-lived as he suffered a serious knee injury just five minutes into the game. By 2004 he had re-established himself within the international ranks and featured in South Africa's 2004 Tri-Nations success. 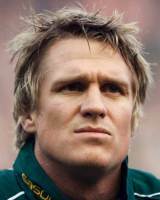 The following year saw him make the inside centre position having won the majority of his previous caps on the wing and he would go on to captain the Springboks against the World XV at Ellis Park on June 11, 2006. He was a regular for the Springboks throughout the 2007 season but a torn bicep injury ruled him out of what would be a victorious 2007 Rugby World Cup campaign. De Villiers' strong run of form continued in 2008 and he played in all 13 of the Springboks' Test including the historic win over New Zealand at Carisbrook and all three matches on their undefeated tour of the the UK. He was also named both the SA Rugby Player of the Year and Players' Player of the Year. In South Africa he played his domestic rugby for Western Province in the Currie Cup and the Stormers in Super Rugby, whom he captained during the 2008 season. In 2009, De Villiers was selected in the first two Tests against the British & Irish Lions as the Springboks took an unassailable 2-0 lead after a couple of hard-fought narrow victories. De Villiers played a pivotal role at the heart of the Springbok side that romped to the Tri-Nations later that year before taking up a contract with Munster. After a difficult start to life in Limerick he enjoyed an explosive Heineken Cup try off the bench as his side won a superb game against Perpignan at the Stade Aime Giral. In February 2010, De Villiers announced his intention to leave Munster in order to secure a place in the South Africa squad at the 2011 Rugby World Cup and in June agreed a move back to Western Province and the Stormers. However, his contribution to that season's Currie Cup was limited due to his return to the Springboks' ranks with coach Peter de Villiers switching his namesake back to wing. But a dangerous tackle on New Zealand's Rene Ranger during their Tri-Nations clash in Wellington saw De Villiers handed a two-week ban.